In this tutorial, we’re going to take a look at the AcuGraph Reference section. When you go to reference section you’ll see that there are 5 tabs across the top. The first tab is Points. 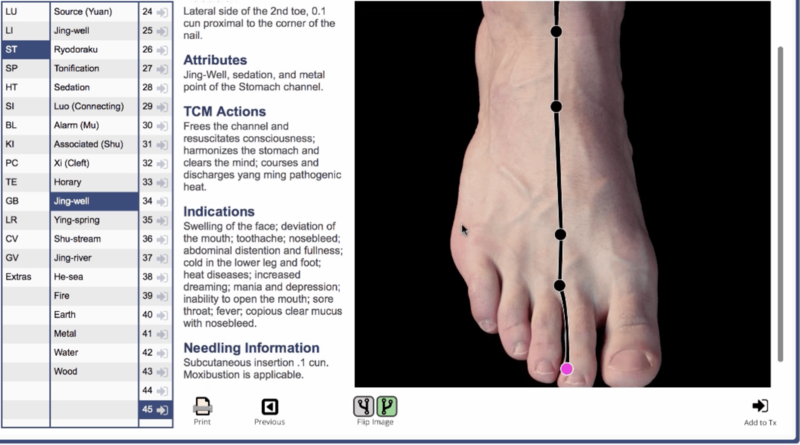 Here you can look up Acupuncture points. They are organized by meridian. And so if you click on meridian name while All is selected, then you get a view of the entire meridian. Or you can click on individual points by selecting point number. Or you can do it by function. Each one of these has the location, attributes, actions, indications, needling information, cautions it’s all there. The second tab is Charts. Here we have the various charts such as Cardinal Points, Five Elements, and so on. Each of the charts here are clickable so you can click on any of the point names or numbers shown in the charts and it will take you to the summary page for that point, complete with an image of the point. Note that there are also Auricular charts: Master Points, Organs, Musculoskeletal, Meridian Points. The third tab is Conditions. Here you will find a list of conditions, alphabetically listed with point recommendations. This is great if you don’t know where to start, you don’t know what else to do, or just need some ideas for some points. 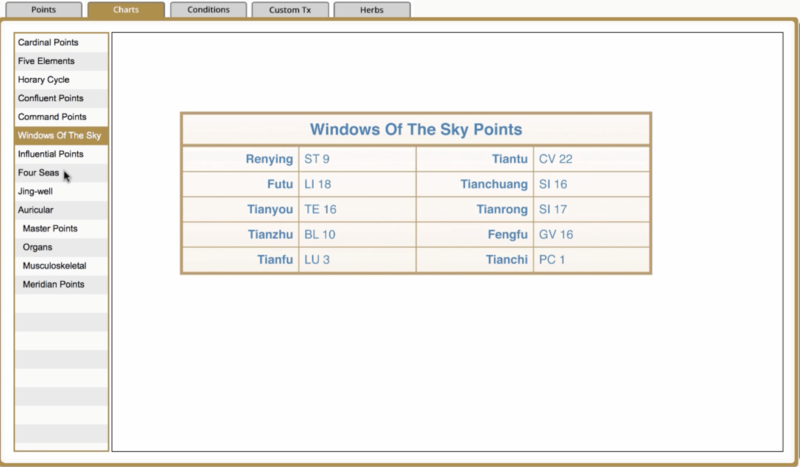 Click on the condition and it will give some Primary Points and Secondary Points for that condition. Of course, these points are clickable as well, for full point details. With a few clicks you can add these protocols to your treatment plan for the patient selected. 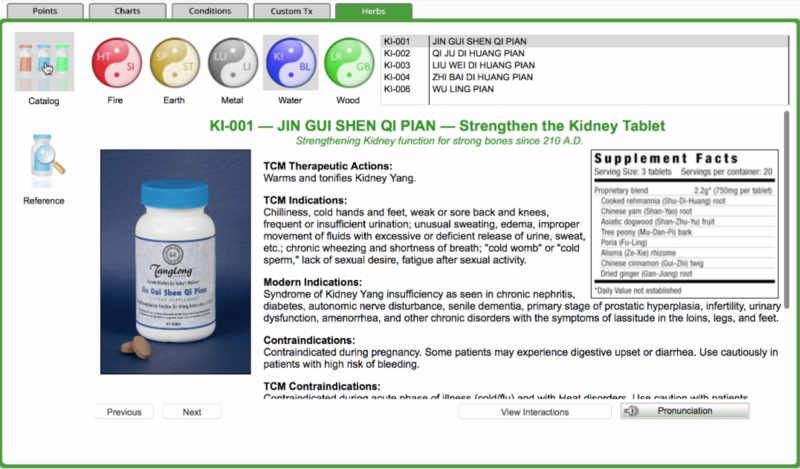 The fourth tab is Custom Tx (treatment) where you define custom treatments you would like the software to recommend when a specific pattern appears on the graph. The fifth tab is Herbs. 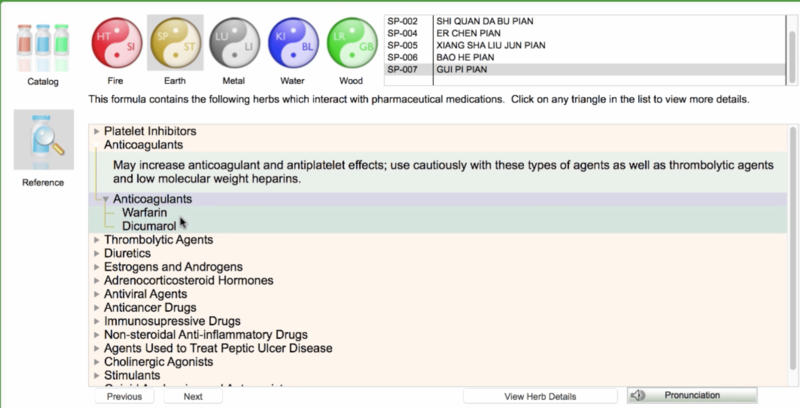 This is a catalog of all the herbs that are found in the AcuGraph software, including Therapeutic Actions, Indications, Contraindications, and so on for each formula. 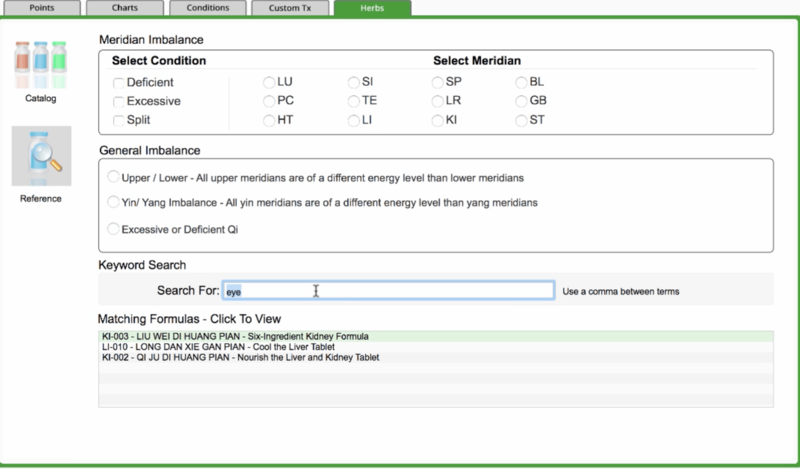 In the reference portion of the Herbs tab you can search for formulas based on keywords. The software will tell you all the formulas that have something to do with the keyword you enter, with the ability to see full details for each formula. 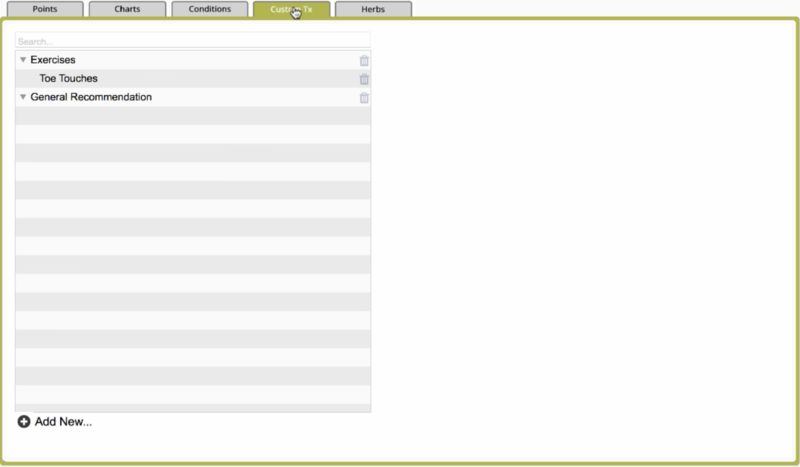 For each of the formulas you can also View Interactions. This will identify what type of pharmaceutical drugs a particular formula may interact with. All this makes it very easy to avoid herbal/pharmaceutical interactions, increasing the safety of your recommendations and your confidence in your herbal prescriptions. There we have it, this is the AcuGraph Reference section. 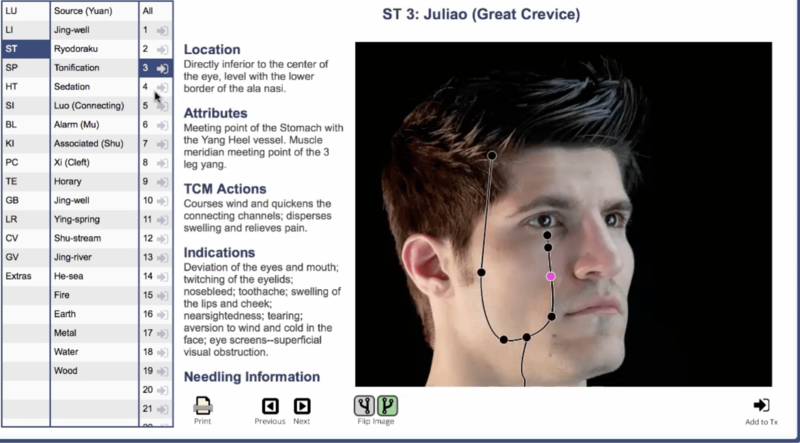 It is designed for fast, easy reference including all the information that you may need while practicing.